I admit it. I have a soft spot in my heart for television. Hours of childhood make-believe and an entire life’s work were inspired by TV and movies. I become a professional ventriloquist because of television—believe me, I don’t come from a family of people who talk without moving their lips. And I spent untold joyful hours playing about characters I encountered on the screen—Flash Gordon and Peter Pan. As an adult, I had the opportunity to bring my puppets to Mister Rogers Neighborhood, and I shared Fred Rogers’ belief in the potential, and the obligation, of screen media to benefit children. So I can’t escape the irony that I now direct The Campaign for a Commercial-Free Childhood, an organization in the forefront of a movement to limit commercialism—and the screen time it supports—in the lives of children. As I wrote in my book, The Case for Make Believe, I struggled long and hard to understand why I am so troubled by children’s relationship to screen media today when my own childhood experience was so positive. But there are significant differences between my experience of screens and that of children today—namely unlimited access and out-of-control commercialism. The Flash Gordon series aired maybe once a year. I saw Peter Pan in a movie theater once when I was 6 and didn’t see it again until I was 19. If I wanted to re-experience the profoundly deep and glorious feelings these characters and the worlds they inhabit evoked in me, I had to play about them. And since they entered my life on a screen only rarely, I had the time, space, and silence to embroider and embellish as I liked—to combine the realms of Neverland and the planet Mongo, home of the evil Ming the Merciless, and to insert myself gloriously in the middle of the action. Preschool children spend, on average, a staggering 32 hours a week in front of a screen outside of school. And too many are adding to that time in school as well. According to a 2009 study in Pediatrics, 36% of center-based child-care programs include television time, for an average of 1.2 hours a day, and a troubling 70% of home-based child-care programs include television time for an average of 3.4 hours per day. To their detriment, and society’s, the default activity for children around the world is to be in front of a screen. In addition to the erosion of children’s creative play, hours spent with screens are linked to childhood obesity, poor school performance and other major problems. It’s daunting to think about the money and power driving the push for a childhood characterized by all-screens-all-the-time. But here’s what’s hopeful: That there’s a need for balance may be getting some traction. The TV blaring in the pediatrics department of my HMO has been replaced by a large aquarium. The White House Task Force on Childhood Obesity has joined The American Academy of Pediatrics in recommending no screen time for children under 2 and limited time for older kids. 70 leading early childhood educators, pediatricians, researchers and child advocates joined CCFC in urging the National Association for the Education of Young Children to take a leading role in the growing effort to reduce the amount of time children spend with screens. 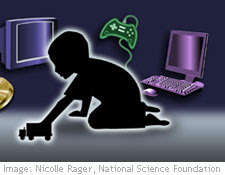 The organization is revising its 1996 position statement on children and technology. I still believe in the potential of quality, commercial-free screen media to benefit children—at least children over 3. But regardless of content, the balance in children’s lives between screen time and time for anything else has gone spectacularly awry. It’s urgent that we set it right. Thank you, Susan Linn. This is beautifully written and I couldn't agree more. You have been one of my heroes for a long time. The problem I see is that parents aren't given enough real options. We have forgotten how NOT to use TV when we need a break from parenting. It starts with babies. Parents are so (understandably) desperate for some down time that they unwittingly begin a vicious cycle. TV, "educational" videos, etc., are a big temptation. We use a little TV and begin to condition our baby to need passive entertainment instead of encouraging him to spend valuable play time in a safe space, occupying himself. We then create the exact problem we are trying to solve with TV -- a child who needs constant entertainment because he loses the ability to generate it on his own. I have a plan for parents who know they need (and deserve!) breaks, but also want to trust their children do what they do naturally (and what many of us used to do), spend long hours blissfully entertaining themselves. The world is changed. We are constantly hit with ads whenever we leave our homes... why let them in? Keep your home a sanctuary from commercialism. Its like finally getting clean air to breathe. We only use our TV to watch DVDs or NetFlix. No commercials, no ads. Its heaven! Good article. My kids are in their 20's now but when my first was born we decided to put the TV in the garage. It stayed there after the birth of my second son two years later and after they had learned to read. No, not just learn to read, I wanted them to love to read. And I wanted them to have plenty of time to play and act out characters they read about and characters and situations they made up. Sure it was hard at first. But mostly because of peer pressure as they got older. If they went over to a friend's house to have a play date I would tell the mom or sitter that if the kids got to a point where they or the sitter wanted them to watch a show in order to "have some peace and quiet" to just call me and I would pick up not only my kids but their kids as well. We practiced this until I think my oldest was in 6th grade and even then TV was very limited and no computer at all until he was in junior high and only supervised and for a limited time. I have albums and albums of photos of all the things my kids did all through these years. Hilarious dress up costumes (I used to throw some of our old clothes into a big hamper and also went to the thrift for interesting stuff), complete rearrangement of the living room furniture and pillows to create forts with the help of sheets and clothes pins and we'd let the forts stay up for days. We also took them outside as often as possible to local parks to play pick up games of soccer, baseball, basketball, whatever. If someone didn't know the "rules" we'd only lightly step in and help the boys if they needed it but often they would allow for changes in the rules to accommodate the differing abilities of each kid. It taught them so much more than they would have ever learned in tiny tots ball or whatever they call those sports they organize for kids under 9, 8, 7, 6,5, 4, and three! Kids need less parenting when they play and more time to discover what interests them. Yes, my boys ended up at age nine and through high school playing basketball, soccer and swimming on local teams and they played well and loved it. They may never know how much their years of not being allowed to be on these teams before this age until they are adults and understand our biggest reason. That kids can get burnt out on sports at just the age you really want them to be engaged in them - their teen years. And it isn't just sports.. it applies to the arts as well. We exposed our kids to a lot of things and we had a great time doing all of it. From playing around with my guitar, to camping and learning to make a fire and how to be really quiet so you could see the animals around you come out of hiding, to canoeing, dancing in the living room to both kid music and "our music"... to road trips to see family and other parts of the US. They are wonderful, well rounded young men now. They are smart, have big hearts, and are making their way in the world just fine without having all that TV and Commercialism in their consciousness during their formative years.